This is Douglas Niedt's outstanding classical guitar arrangement of the great jazz standard by Paul Desmond, made famous by the Dave Brubeck Quartet. This fingerstyle arrangement can be played on a nylon-string classical guitar, acoustic, or steel-string electric guitar. For intermediate to advanced players. Learn to play Take Five like a pro. 88 pages of music and 2 1/2 hours of video. This cut is from Doug's classical guitar performance video, American Virtuoso. First, the basic version in standard notation and tab (11 pages). By the way, the sample below is a web image. The PDF version you receive will be crystal clear. The annotated score without videos. 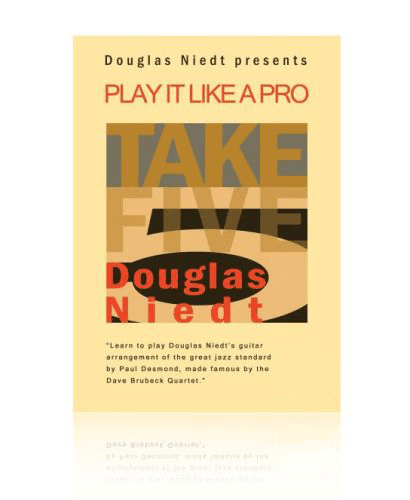 This version is marked measure by measure with detailed performance instructions, so you can masterfully play Take Five with pro-level execution (32 pages in standard notation and tab). Again, the sample below is a web image. The PDF version you receive will be crystal clear. The annotated score with embedded videos. This is an extraordinary format. 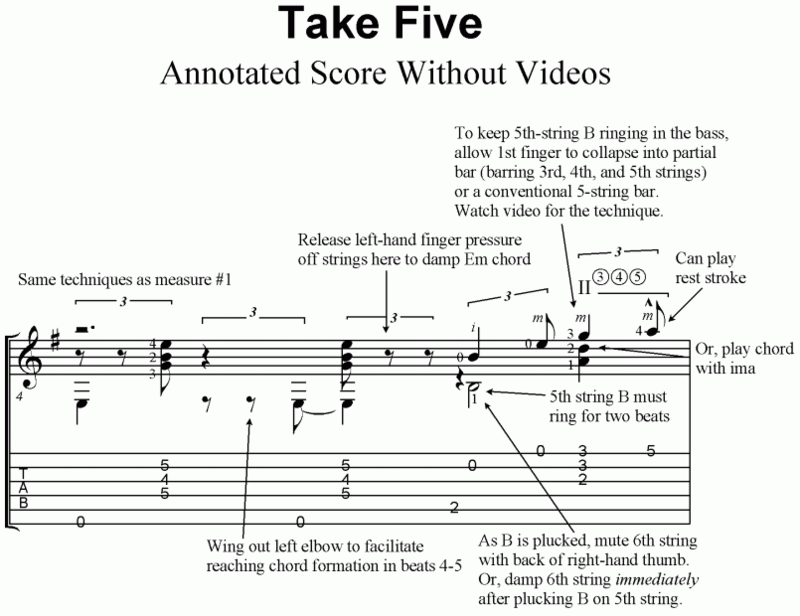 It is an annotated score with detailed performance instructions for one measure at a time, PLUS that measure's matching embedded high-def video showing how to play it. This runs 45 pages in standard notation and tab. Remember, the sample below is a web image. The PDF version you receive will be crystal clear. Doug demonstrates how to play Take Five measure by measure in great detail. These are not "put your finger here and then put your finger there" type videos. Doug explains all the technical and musical details required to play the piece on a professional level. Watch Doug demonstrate measure #1 on full screen--after pressing play, click on symbol in lower right-hand corner to the right of "HD". Buy now! 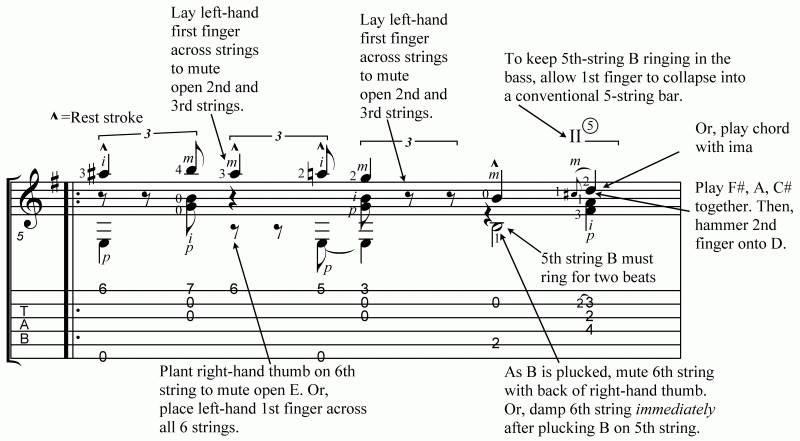 An all-in-one classical guitar lesson. It's complete and comprehensive. Available as a package only. Includes the three versions of the arrangement (88 pages of music) plus 28 video classical guitar lessons. The total package costs less than a one-hour guitar lesson in many cities. PLAY IT LIKE A PRO will save you time and money. The video classical guitar lessons will show you exactly what to do to help you learn to play Take Five on a professional level. Learning the piece with a teacher would take many hours of lessons and cost you hundreds of dollars. 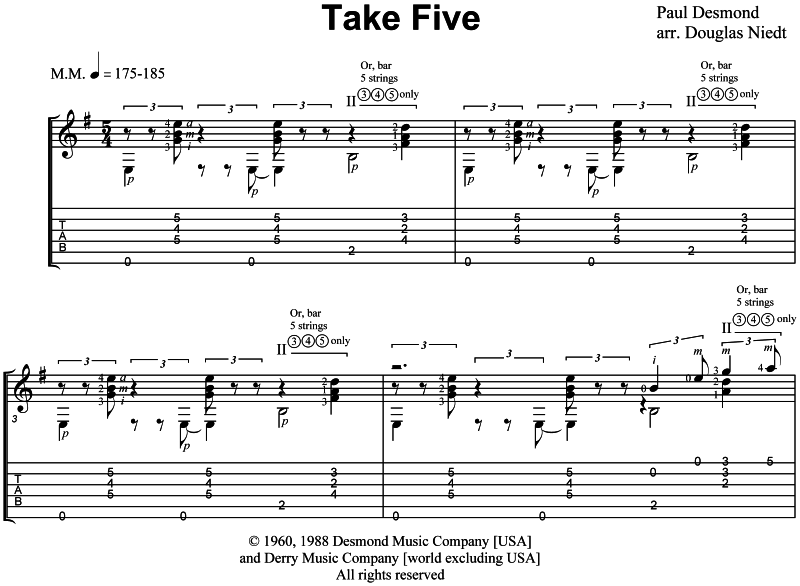 You will not find a classical guitar arrangement of Take Five of this quality anywhere else. It is the only arrangement for classical guitar approved for publication by the publisher of Paul Desmond's music. How good do I have to be to play this arrangement and what techniques do I need to know? This arrangement is for intermediate to advanced players. 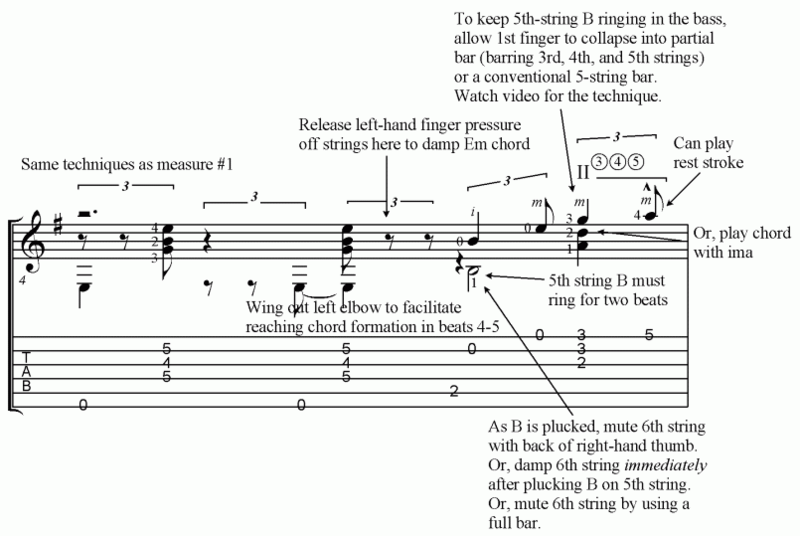 Basic techniques such as rest stroke, free stroke, and bar technique should be second nature before learning the arrangement. Can I print out the music? Can I save it and the videos to my computer? Yes and yes. The music is in PDF format. Print it and save it to your computer as you wish. You can also save the videos to your computer. Downloading the videos is recommended. That way you will always have access to them if you travel or if your Internet connection is erratic or slow. You don't have to download them all at once. Download each video as you get to that section of the music. Read more about Doug's goals for this arrangement. Read more about the story behind Take 5. Read more about Paul Desmond, the composer of Take 5. What is that opening rhythm and what are those Take 5 chords?